Similarly to the healthcare system, there are a variety of specialties within dentistry.There are specialists who focus solely on providing root canals or oral surgery within their communities. Some dentists choose to specialize in gum health, while others want their primary focus to be on pediatric dentistry.There’s another specialty not many people know about. It’s called sports dentistry and it’s vital to anyone involved in sports. What Is Sports Dentistry and Who Can Practice It? Soft tissue damage (biting the tongue or cheek). You might think the patients a sports dentist treats are mostly football players or boxers.While athletes who engage in these types of contact sports are definitely in need of a sports dentist, they aren’t the only ones.Nearly every athlete is at risk of injury. Recently, ballroom dancer Derek Hough told his Instagram followers the worst injury he’s ever experienced was nearly biting his tongue off. He bit it so hard it was “hanging by a thread.”Probably the most common dental injury sustained by athletes, though, is losing a tooth. They get bumped in the face or hit by a ball and their tooth breaks or pops out completely. A tooth which has been fractured can be treated in three different ways. If damage is minimal, we can place bonding on the tooth to repair the fracture. We may need to put a crown over the tooth if the damage is more significant. Sometimes, a root canal is indicated. If the root has been fractured, it will likely need to be extracted and replaced with an implant. Sometimes, when a tooth is knocked out, we can re-implant the tooth as long as it’s still healthy. There are instances where athletes need root canal treatment after a tooth has been knocked out.In other cases, we aren’t always able to save the tooth. In these cases, we can replace the tooth with an implant and crown or a dental bridge. Sustaining a dental injury is nearly two times as likely if an athlete plays without wearing a sport guard.These mouth guards act as shock absorbers. When an athlete gets hit in the mouth, the guard takes most of the force, protecting from teeth and jaw fractures.Studies have also shown that lip and oral lacerations decrease when athletes wear sport guards. Chewing tobacco is synonymous with baseball, but other athletes have been known to chew or smoke tobacco.This is one of the worst habits anyone can take up because of the dangers of mouth and throat cancer.It is our job as dentists to educate our athlete patients – and our patients in general – on all of the dangers of tobacco. 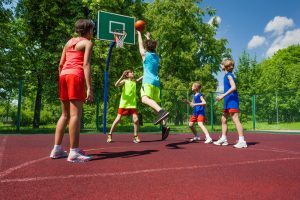 For quite some time now, coaches, athletes, and parents have all been alert to the bodily injuries which can happen while playing sports.To protect athletes, all kinds of guards were made – from knee pads to helmets.Over the years, protective gear has evolved. Even in professional sports, athletes are doing more to protect their body from injury. Baseball players, for instance, are wearing batting helmets which protect their jaw.We’re really excited more and more people are getting on-board with protecting their teeth while playing sports, too.And we will continue to do all we can to help the athletes within our practice protect their teeth and their dental investments.If you have any questions about protective wear or how we can treat a dental sports injury, we invite you to contact us or ask at your next appointment.Together, we can protect your teeth for a lifetime – even if you play sports!